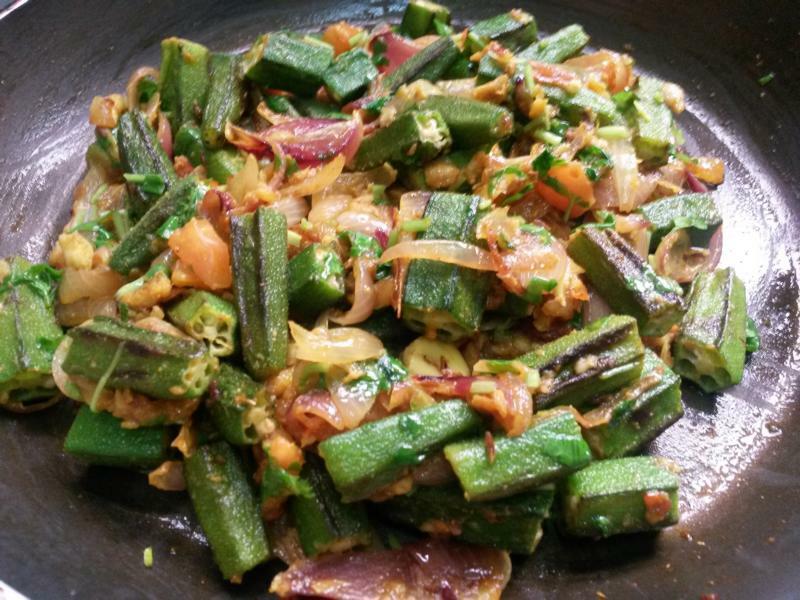 I have said before, that bhindi / okra is one of the commonly cooked vegetables at home. Everyone likes it, and it is always a good addition to a whole Indian meal. Since it is such a versatile vegetable, you can cook it in several different ways. And if you are not a big fan of bhindi by itself as a vegetarian dish, you could always dunk in a handful in meat stews, soups or sambar simply for its health benefits. 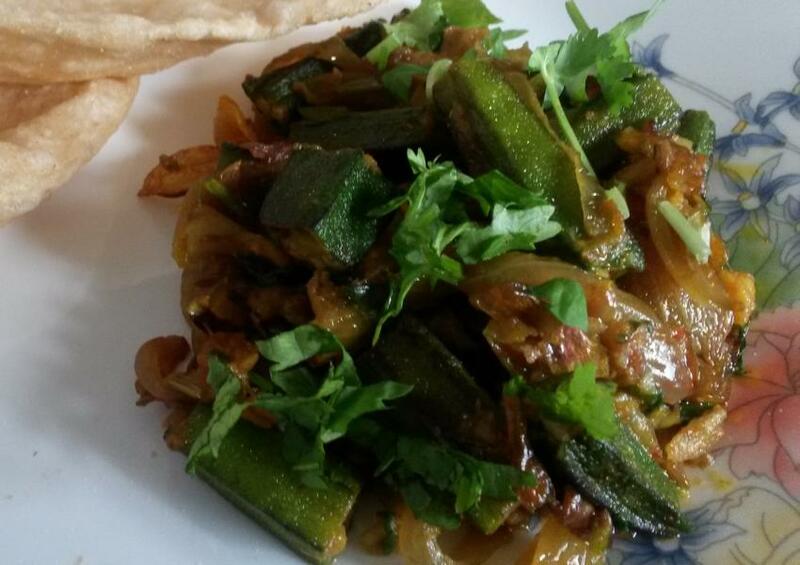 Here is another commonly prepared dish in India – bhindi masala. I am sure everyone cooks it their own way, some with more spices, some with less; and surely everyone chops their okra differently! I made this a while ago along with the Bidari paratha. It has been pending since. The combination was simple and delicious. It also goes well with roti, rice and dal. Wash them thoroughly and let it dry completely before you begin to chop them. His helps in avoiding the sticky mess. You can pat them dry with a cloth or kitchen towel. Drizzle some oil in a pan and fry the bhindi till lightly browned on some sides. 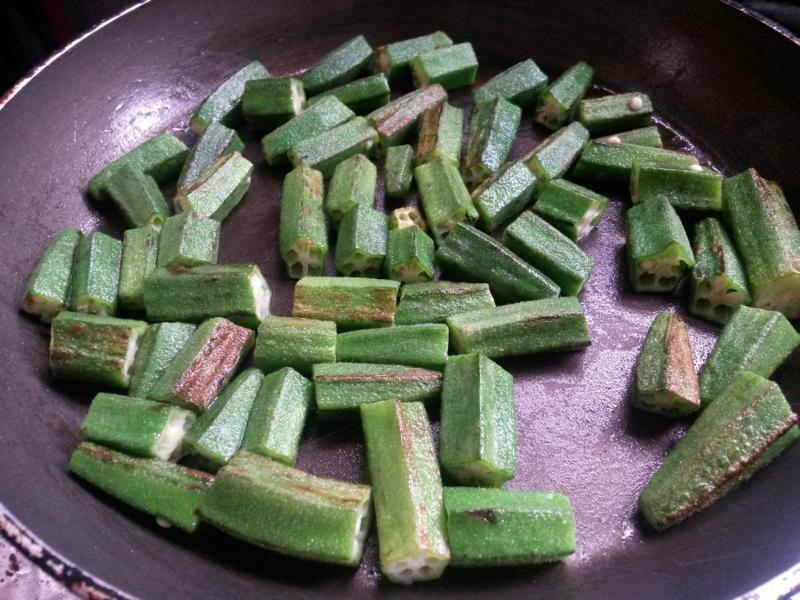 Remove the okra from the pan and set aside. In the same pan, heat some more oil and throw in some cumin seeds. 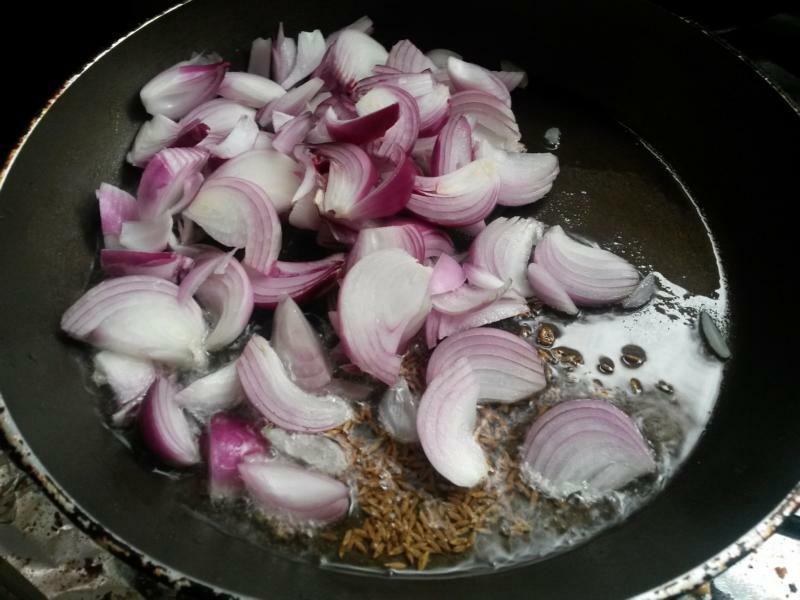 Once they start to splutter, add the chopped onions. Add chopped tomato and fry till the tomato is soft. Lastly add the fried bhindi and salt, mix well and cook for a 1- 2 minutes. Okra cooks fast. A good stir and couple of minutes is more than enough. Check if you are comfortable with the bite, or you can let it fry for a few more seconds. 200gms Bhindi/Okra – washed and wiped with a cloth or a kitchen towel. Chop into big pieces when completely dry. In a non-stick pan, drizzle some oil and fry the bhindi till light brown and keep aside. 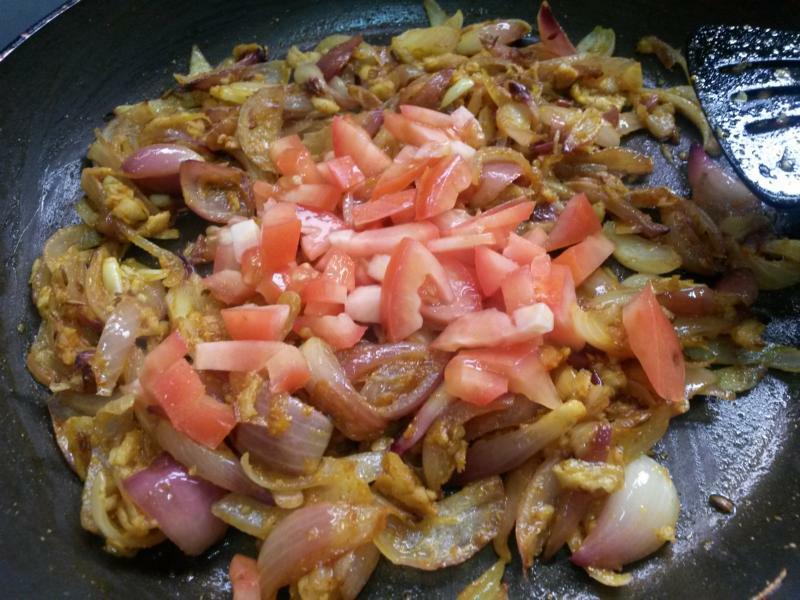 In the same pan pour around 1-2 tblsp oil and when the oil is hot put the cumin seeds and once it starts to splutter add the onions and fry till it turns translucent. Add the powders and ginger garlic and chilli mix. Sauté for around 2-3 minutes. Then add the tomato and fry well. Lastly add the fried bhindi and salt mix well. Stir-fry on medium flame and keep tossing in between. Add the coriander leaves and switch off flame. 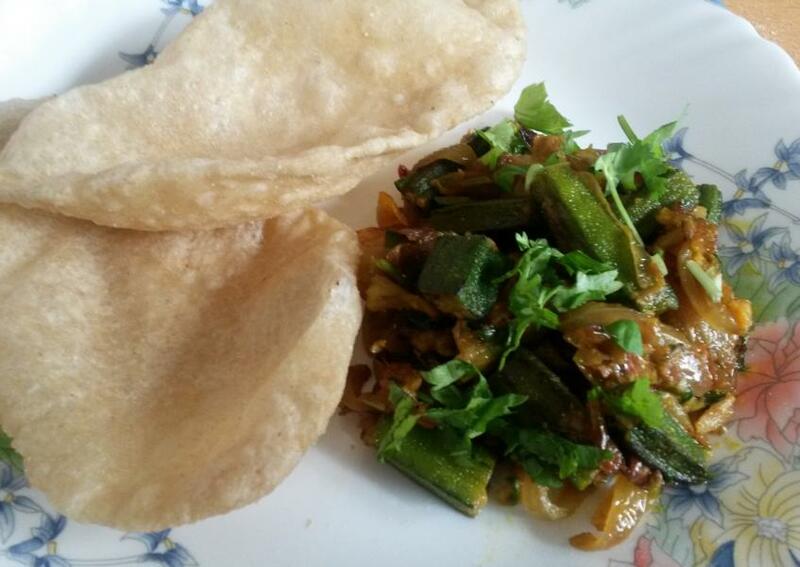 Serve hot with bidari paratha or puri. THis is timely. I’ve been searching for a good Okra recipe. Thanks for sharing! Do let me know if you try it… it is super easy to make. This is something i have never tried. will surely try it out. 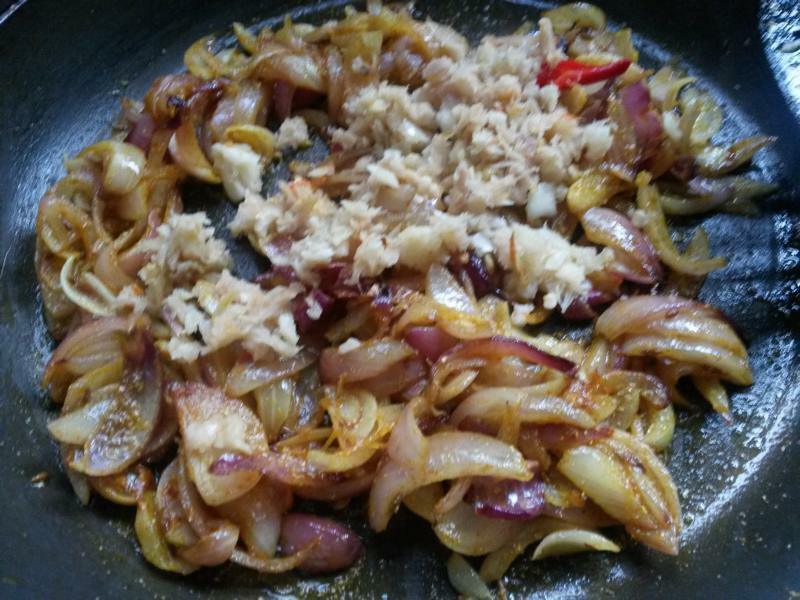 Thanks Peri.Do try out the recipe… Happy cooking!!! Ooh yummy I love okra!!! Thanks for stopping by.Hope you have a great day. Happy cooking!